I bought a bunch more Moda scrap bags, these are leftovers from making the precut jelly rolls and whatnot. I was able to buy particular designs so I got several of each kind including ones to match the previous purchase. I spent the evening going through them to see what I’ve got, sort into rational groups and generally play with a pile of fabrics. They are selvedge strips of varying widths, more or less all 32 inches long. Each scrap bag contains (mostly) fabrics from the same line, but occasionally others are mixed in. I have a couple ideas for projects but so far the only thing I’ve done was with some odd strips from an earlier bag. I bought more of the same so I combined them together. The designs represented are Birdie, Nature’s Notebook, Secret Garden and Eden. Posted by feorlen on 23 December 2009 at 10:38 pm under quilting, sewing. I had to think about it a while, but now having done a couple of things with pre-cut fabrics for quilting I’m happy with the results. I’m not a huge scrap quilt fan so I don’t need to obsess over how many different designs are in my project. I buy several jelly rolls because I want duplicates, plus the ability to divide the set into multiple projects and still get something decently sized. I don’t see myself doing a complicated original design out of a pre-cut set, but I’m also not doing many of those kinds of quilts. A matching collection of fabrics is nice for gifts, I don’t have to worry about getting the arrangement just so because it will look good pretty much whatever I do. I think 40 strips in a jelly roll is a little limiting because you have to add a lot of other fabric to get a decent bed quilt, but it’s a minor quibble because I have a closet full of possible choices. 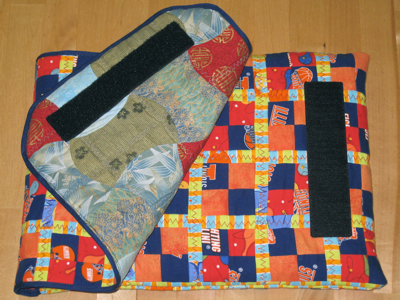 Once I sorted the pieces I wanted to include and cut strips, it was mindlessly simple to sew the blocks together. The worst thing that happened was I accidentally stitched one block with one of the pieces wrong side up. The layer cake and charm packs went together easily into the three block types. Putting together the smaller charm squares was dead simple and the others were only a little more complicated. 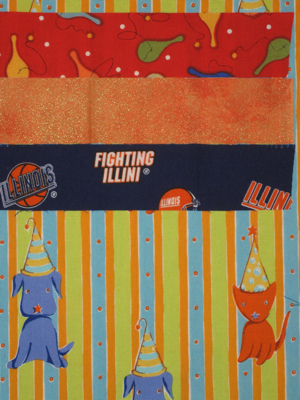 It’s instant gratification quilting. Posted by feorlen on 30 November 2009 at 10:01 pm under quilting. I’ve got a couple things underway, both from some precut fabrics I bought. I had two Love is in the Air jelly rolls, I took the brown strips for a small quilt and the rest for a larger one. 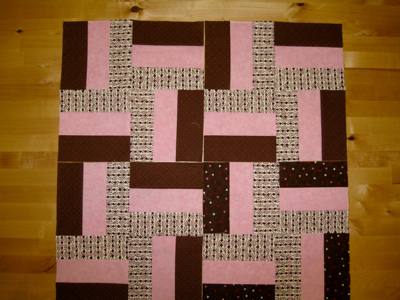 With the brown strips, I combined them with two other pink and brown fabrics and made rail fence blocks in a pinwheel arrangement. There are six different fabrics in my brown strips, so I’ll have six slightly different types of blocks. 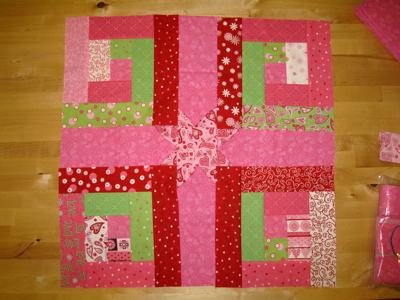 From the remaining pink, white and green strips I added some additional pink fabric and I’m working on a log cabin and star design. When I’m done I’ll have directions to post but I want to make sure they actually worked first. It’s fairly complicated and I tried to cut the strips as efficiently as possible, which was a challenge. Posted by feorlen on 12 November 2009 at 9:30 pm under quilting. Posted by feorlen on 31 October 2009 at 5:55 pm under quilting. 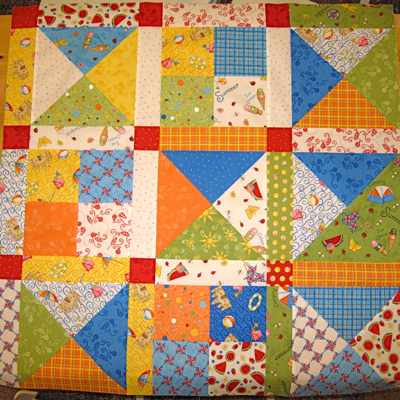 I’ve been doing more quilting lately, mainly because it doesn’t take huge blocks of time. I can work on something for ten minutes and put it down, which is not possible with most of my other projects. Haven’t had time to update the blog either. Some are gifts I can’t post yet anyway. Can you tell which is mine? I was intending to make one from the blue log cabin handwoven fabric but it wasn’t wide enough. So I used a cotton print in traditional overshot weaving designs. If you don’t look too closely it looks like an overshot center rectangle with borders. 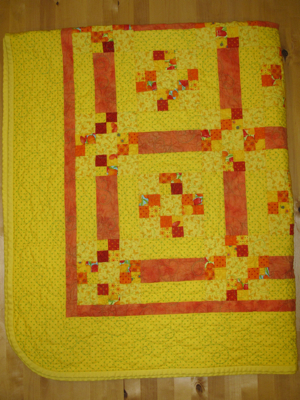 As quilting goes it’s very very simple but it works. I pulled out a couple fabrics, tossed in a leftover from another project, and made a laptop sleeve of one inch squares in a four patch design. My goal was to take some fabric I hated and make it into something interesting. I still have a hard time saying I like it, there being much orange involved, but I think it was successful. It’s sure bright, anyway. The small pieces disguise the objectionable patterns in the fabrics so you don’t notice as much. Adding the red much improved things and I had some strips already cut from another project. I learned a few useful things, like don’t try to apply binding directly over all those seams. I won’t be doing any large projects with so many tiny squares, either. I made the inside a different pattern, in some more reasonable colors and a design I’ve been wanting to try but not commit to a large project. It was the first time I’d done curved seams for a quilt block. Interestingly, after I had already decided to use this I found out it’s a traditional quilt shape called Apple Core. Which was particularly funny since not only is it for a Mac laptop, it’s for an Apple employee’s Mac laptop. 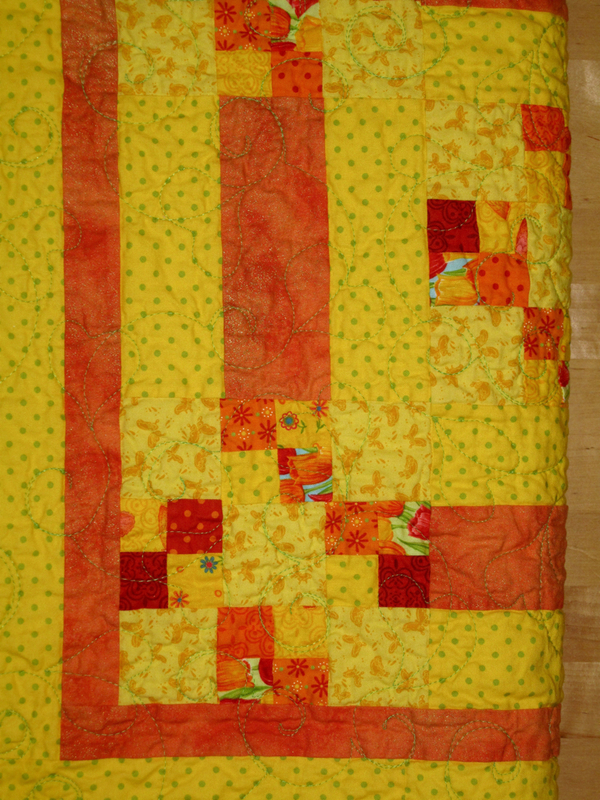 In piecing the curved blocks I discovered that my quarter inch seam allowances weren’t up to snuff. This made matching the rows annoying and I had to iron it to death to get it flat. After much quilting it’s hard to tell, but I’m still happy it’s only the lining. I have some other projects in the works but they are mainly gifts. 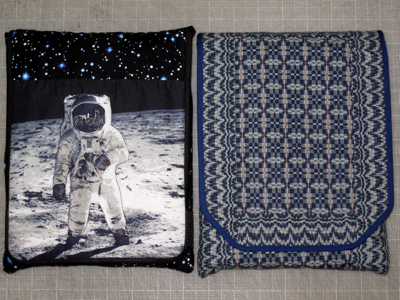 One is out being machine quilted, so soon we’ll see how that experiment goes. I’ve seen other work by my quilter so I’m expecting good things. I’m trying to finish one more quilt to drop off when I go pick up the finished one. Posted by feorlen on 13 September 2009 at 8:56 pm under quilting.